Don't go looking for that book just quite yet. It'll debut on October 30, 2018. And it's the second book of 2018 we'll see from the man (the other one is a taut thriller by the title of THE OUTSIDER). 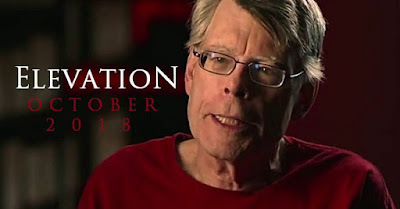 What makes this new announcement on his second novel rather, well, novel is the fact that along with some other projects he's taken, this particular book called ELEVATION deviates a bit from the standard horror tropes we expect. And if you know King, you know that's a sprint of a story. Usually his yarns can go for miles and miles, like DUMA KEY or UNDER THE DOME (the latter clocks in at a freakish 1,074 pages LONG). Yet he pulls this one out of his scary hat, and we're treated to something of a novella even though this one's being billed as a novel. Pretty cool, and honestly not far from King and his passions for what many readers might know as the "short story." Believe It or Not, This Book ELEVATION Isn't Actually Horror at All! We'd even go as far to say that ELEVATION is largely an "upbeat" tale touching on divisive culture and real-world issues affecting our society today. Make no mistake: elements of King storytelling are still here, but don't expect to have the pants scared off of you. And arguably that's the best quality of Stephen King we could ever want. A lot of his books tend to be like that. Obviously he doesn't shy away from the supernatural or the inexplicable. But the true horror stories definitely come from all around us. In the store. At church. In school. And even while we're at work, filing papers.